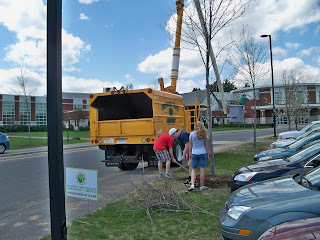 Dr Alex Shigo, World Renown as the father of Modern Arboriculture once remarked that touching trees in addition to being good for the soul was also good for the trees; “Touching Trees” is a very good way to capture the events in Sturbridge of this Arbor Day 2011. A significant milestone was reached with over 54 residents and business along with some 50 Burgess students, 60 Tantasqua Regional HS Students and two local tree care and 1 landscape company all coming together to celebrate Arbor day in one form or another. hands all touching one of the 55 Bare root trees planted for Arbor day. Deputy Tree Warden Joe Kowalski, Vice Chair of the Tree Warden's Advisory Committee (TWAC) who owns Ganesh Tree and Plant Health Care, was the lead organizer in organizing the 55 bare root tree planting Arbor Day Celebration effort and Tom Chamberland Sturbridge Tree Warden administered the tree seedling program and Arbor Day of Service at Tantasqua Regional High School. Using the National federal volunteer rate of $21.36 per hour, Arbor Day Volunteers amassed a combined total of over 434 hours worth a total of over $ 10,170.00 in value of the effort in beautifying the Town. A special thanks goes out to the members of, and volunteers with the TWAC, Including Lois Kelly, Doris Sosik, Al Champagne, Leslie Wong, Pamela Hoy, along with the residents of the Preserve Way subdivision, Greg Morse and our DPW staff, and with Calvin Montigny, Chair of the TWAC and his company Montigny Landscaping, who all participated in one way or another to insure our 55 bare root trees found a home as quickly as possible. To 6th Grade Burgess School teacher Amber Kelly, and her two science classes who bagged and handed out some 1000 seedlings. Tantasqua Regional HS Teacher David Stanley and his three science classes who came out and assisted Dennis Panu and myself in trimming, mulching and caring for the trees planted as a part of the new school building project. during the Arbor Day of Service on Friday April 29th.